On our first full day at the lodge, we woke up before 7 am and hubs so kindly wandered down the hall and found me a cuppa dark roast Starbucks coffee. Not espresso – but dude, STARBUCKS. Grabbed our inner-tubes and hit every. single. slide. (At least twice, including the body slides which didn’t require tubes, just skin.) 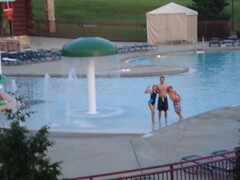 To top it off, we even stood under the giant Great Wolf Lodge water bucket where thousands of gallons of water dropped on our heads, then we floated along in the Lazy River where we were anything but lazy. Finally, we headed outside to enjoy some rays and a game of water basketball, but found clouds, a cool breeze and goosebumps in the 74 degree-ish temps. Ah well, back later after the clouds broke and we found ourselves some rays and I attempted to even out my lopsided tan. Back to the room for lunch in our suite: me Lean Cuisine, CG EZ mac & cheese, CS Hamburger Helper Microwave Singles lunch, hubs sandwich & chips on our balcony. Soon enough we zipped back over to the water park before CS could get too wrapped up in the Sponge Bob Squarepants marathon on cable, where we wore ourselves out to the point of hungry exhaustion, then showered up at the room before taking our empty stomachs over to Camp Critter. A bowl of French Onion soup and a turkey sandwich did the trick for me, and the Catholic Family & I enjoyed a peaceful dinner under the indoor tent and tree-like setting of the restaurant. Next we finished decoratingthe CK’s t-shirt crafts at the Cub Club, which made some seriously cool custom souvenirs. The Northern Lights Arcade beckoned us over for some game playing & ticket redeeming, with Catholic Girlie walking away with white fuzzy dice & 3 Tootsie Rolls and Catholic Son a wolf figurine. Then lastly, we shut the water park down, slipping down the water slides a few more times for the evening and playing a 2-on-2 game of water basketball at the outdoor pool. Final score: Me & Hubs, 13, Catholic Kids 15. Grab a hankie for this one. Remember that ‘Tween Pottery class Catholic Girlie attended a few weeks ago? Well, basically, her project exploded in the kiln. 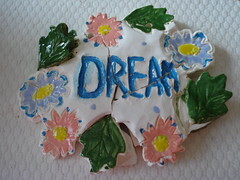 As it turned out, her ‘DREAM’ creation was the only work of art that didn’t make the cut while baking at 1200 degrees with her fellow classmate’s pottery, probably due to an air bubble in the clay – or so the owner thinks, anyway. What to do? Take advantage of that nice little store credit she received and make another non-explosive clay creation. *sniff* Let’s all bow our heads in silent prayer. The day wasn’t all that exciting today except for the fact that Mr. George stood us up for Catholic Son’s baritone lesson and that we spent the latter half of the afternoon & early evening in a tornado watch. Both of those items are equally serious as 1) Mr. G had rescheduled the lesson due to his girlfriend’s gall bladder surgery, and not showing up made little red flags wave around in our heads and 2) we’re planning to pull a late-nighter in hopes of staying twister-free during our sleep. Where’d all the happy go anyway? Ok, here it is! 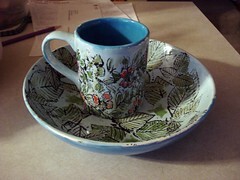 I leave this post with a fancy photo Catholic Girlie took of her hand-painted pottery created in ‘tween’ class. Enjoy!